If you are looking to plan a fun filled day with friends or family in sunny Crystal River Florida during the months of July to September, scalloping is a trip you should not pass up. Our scallop trips in the Gulf of Mexico go out once a day. Scalloping is a huge Easter egg hunt under the water. While floating along the surface you will also see various fishes, plants, coral and possibly sea horses. Sea horses should not be bothered, just look at their beauty as they swim past while you hunt for scallops. Before booking your scallop trip with Family Adventure Charters, we check the tide charts to see when low tide is for the day. Low tide the best time to go scalloping because the water is only be about 2 to 5 feet deep which allows you to find and grab the scallops easier. Scallop beds are located mostly in shallow water and may only be harvested by hand or net. For $90.00 per person we furnish all the equipment you will need for this trip the saltwater fishing license, snorkel, mask, fins, and net. 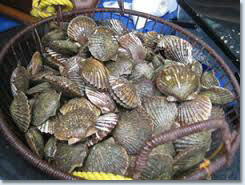 Each person has a limit of two gallons per person of in the shell unclean scallops. Not only is everything furnished by Family Adventure Charters, but our captains know where all the best scalloping spots are. Scallop season opens around the first of July until the 29th of September you can book anytime. The boats we use for our scallop trips are a 30 ft. Sportsman fisherman and a 22 ft. Flats both boats are a smooth and enjoyable ride out to the Scallop grounds. 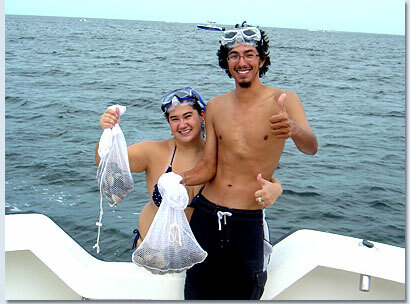 To book a Family Adventure Scalloping Charter, call us direct at 352 445-5489.